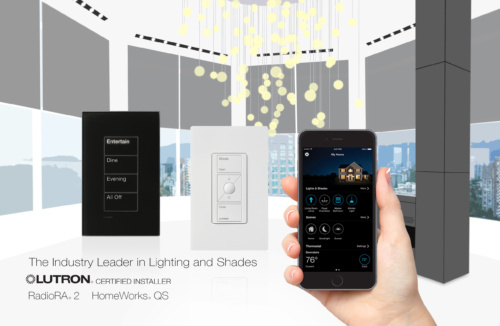 Lutron Homeworks QS + RadioRa2 Certified Installers | Old Cove Integrators L.L.C. At Old Cove, we pride ourselves in the certifications we have earned. Becoming Lutron HomeWorks QS and RadioRa2 dealers is no easy task. Kevin and I started our company in 2010. It took us 3 years of hard work and hustling for projects to get Lutron’s attention. Most companies average 15 years in business before getting a chance to sell high-end Lutron. To our surprise, it wasn’t about numbers for them at all. Lutron is a company that cares about relationships. Lutron is a family-run business with a long list of standard-setting patents in the lighting and shade industries. Also, the majority of their talent are 20+ year employees (a direct result of happy work life!). Considering our loyal, family oriented business practices, we quickly realized this was a company we needed to be involved with. Our amazing rep Scott Davis aided in our progression, and very soon we were able to offer clients the highest tier products available from Lutron. I know what you may be thinking: Can’t anyone walk into The Home Depot and buy simple Lutron Caseta dimmers and switches? Yes, you can. These simple systems work well in a single-room set-up or small apartment. As projects scale up in size and quality, one must consider RadioRa2 or HomeWorks. This is where we get involved. RadioRa2 is a system that allows up to 200 devices; this includes dimmers, switches, keypads and shades. RadioRa2 is a great solution for anyone who wants to retrofit their current house. All it takes is a one-for-one swap of any existing dimmers or switches with RadioRa2 hardware. Everything works with traditional electrical wiring keeping it simple and straightforward. After RadioRa2 hardware is installed, Old Cove enters the 2nd phase: programming. Here we add keypad scenes and automatic schedules. For example, a “WELCOME” button will light a pathway as you enter your property. At sunrise, shades will incrementally open to gently wake you up with light. This process of awakening multiple senses simultaneously delivers a relaxing start to the day. For new builds and larger systems that require over 200 devices, look to Lutron HomeWorks QS. This unparalleled control technology allows us to surpass the capabilities of the “simple” system and deliver a truly unique experience. A next-level HomeWorks system, for instance, would be designed with beautiful Ketra LED light fixtures, schedules that focus on circadian rhythm and saturated color that compliments the scheme of each room’s individual design. Old Cove certified Lutron systems come with the highest level of service and quality; standard. We are backed by the industry-leader in lighting and shades, and we are here to be your resource for light fixtures, LEDs, Sivoia QS motorized shades, energy-conscious builds and wellness focused solutions. Did we mention this is the same technology used by the White House, Empire State Building, NASA HQ, LEGOLAND and more? The list goes on and on, and there’s a reason why the best choose Lutron! Ask us how to get started!